Kuusamo is a town and municipality in Finland. It is located in the Northern Ostrobothnia region. The municipality has a population of 15,219 (31 August 2018) and covers an area of 5,808.92 square kilometres (2,242.84 sq mi) of which 830.81 km2 (320.78 sq mi) is water. The population density is 3.06 inhabitants per square kilometre (7.9/sq mi). Kuusamo is a major center for winter sports and receives approximately a million tourists every year. One of the largest ski resorts in Finland, Ruka, is situated in Kuusamo. Ruka is also the host of many international competitions in ski jumping, cross country skiing and Nordic combined. The 2005 World Championships of Freestyle Skiing was held in Kuusamo. Kuusamo Airport is located 6 kilometres (4 mi) north-east from Kuusamo town centre. Until the 17th century, the area of Kuusamo was inhabited by the semi-nomadic Sami. During the cold season they lived in the villages Maanselkä and Kitka. In spring they moved to the rivers and in summer, after the melting of the ice, to the lakes; there they fished and gathered berries and mushrooms; in autumn they hunted reindeer, bears and beavers in the forest. Apart from fishing and hunting the Sami earned their living by trading fur with the Finns settled on the coast of the Gulf of Bothnia and the Karelians of the White Sea coast. As a Sami settlement the area belonged to Kuusamo Kemi-Lappmark at the time. Nominally it belonged to the territory of the Swedish province of Västerbotten, but the Swedish rule was limited to the collection of taxes. At the same time Russia collected taxes in the territory it deemed state-less. From the 15th century Finnish fishermen also took advantage of fishing grounds on the lower reaches of the river Iijoki near Kuusamo. They took regular trips of a few weeks from Kuusamo, but because the land could not provide hay for cattle other than near the river, they founded no fixed settlements. Only when, in 1673, the Swedish government granted all settlers in Lapland a tax exemption for 15 years, did settlers from Savo and Kainuu settle in Kuusamo. They practiced slash and burn as a form of shifting cultivation. This put the Sami's hunting way of life at risk. Within a few decades the Sami population was assimilated or ousted by the Finnish settlers. By 1718 there were only two Sámi families in Kuusamo, who had already adopted the Finnish language. The first parish in Kuusamo was founded in 1685. In 1687 a temporary chapel was built, in 1695 the first church. From the end of the 17th century the area around the lake Kuusamojärvi began to be called Kuusamo. The precise etymology of the name is unclear, however, one possible derivation is from a Sami word for "spruce forest". The Swedish–Russian border had already been withdrawn east of Kuusamo in the 1595 Treaty of Teusina, but was long and porous. With the constant influx of new settlers, Kuusamo grew steadily in the 18th century. 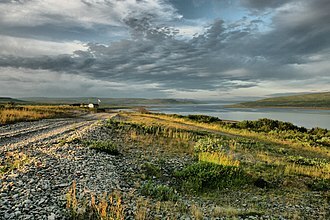 Agriculture, cattle and reindeer husbandry replaced nomadic cropping. Kuusamo around 1770 had about 2,000 inhabitants. In 1775 Kuusamo was removed from Lappmark and added to the newly formed province of Oulu . Because the population had increased, a new, larger church was built between 1797 and 1804. By the beginning of the 19th century the population had reached 3000 inhabitants, but a famine in 1803 and a smallpox epidemic the following year reduced the population again. In 1809, Kuusamo, as with the rest of Finland, came under Russian rule. In the first half of the 19th century, the area was ravaged several times by devastating famine and epidemics. Kuusamo was spared by the catastrophic crop failure in 1867, and its population grew steadily thereafter. By 1886, 7,000 people inhabited the city; by 1894, that number grew to 8,000. With the advent of forestry at the end of the 19th century, workers moved into the area, so Kuusamo reached a population of 10,500 by 1910. In 1868, in Finland's administrative reform the parish of Kuusamo became a municipality. 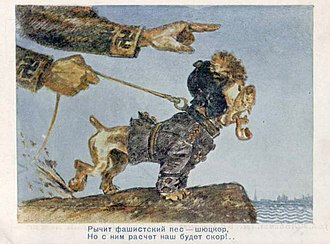 After the independence of Finland in 1917, the Russian border was closed and so Kuusamo was cut off from its hinterland. The forestry sector suffered as there was no more wood to raft from Kuusamo to the ports on the White Sea. Even the reindeer economy suffered as some of the herds remained on the Russian side of the border. Therefore, between the wars agriculture developed as the most important part of the economy. By 1925 the population had risen to 14,634, but it fell by around 2000 the next year through the detachment of the villages and Posio Suolijärvi Kuusamo. In the years between 1945–1952 Kuusamo was rebuilt. By the late 1960s, the population grew to almost 21,000. As agriculture in the village could not offer enough jobs for the baby boomer generation, the population began to decline rapidly. In 1954, the first ski run on the Rukatunturi was created. Through the expansion of the Ruka ski center, Kuusamo became a tourist center. In 2000, the municipality of Kuusamo was made a town. Kuusamo lies in the east of Finland in the Northern Ostrobothnia region on the border with Russia. The town of Kuusamo is only a small part of the municipality. The neighboring municipalities of Kuusamo are Suomussalmi in the south, Taivalkoski and Posio in the west, Salla in the north and Russia in the east. The nearest large towns are Rovaniemi, 192 kilometres (119 mi) northwest, and Oulu 215 km (134 mi) southwest. The distance to the capital Helsinki is 796 km (495 mi). Kuusamo covers an area of 5,808.92 square kilometres (2,242.84 sq mi) of which 830.81 km2 (320.78 sq mi) is water. The community center of Kuusamo, where nearly two-thirds of the population live, is only a small part of the territory. The rest of the municipality consists of sparsely populated, mostly wooded areas. Therefore, the population density of Kuusamo is only 3.06 inhabitants per square kilometre (7.9/sq mi). Apart from the city, villages include Alakitka, Heikkilä, Hiltunen, Irni, Jokilampi, Kallunki, Kantokylä, Kemilä, Kero, Kesäniemi, Kiitämäjärvi, Koskenkylä, Kuolio, Kurvinen, Kärpänkylä, Käylä, Lämsänkylä, Maaselänkylä, Murtovaara, Poussu, Puutteenkylä, Rukajärvi, Määttälänvaara, Soivio, Suorajärvi, Tammela, Teeriranta, Törmäsenvaara, Vasaraperä, Virrankylä, Vuotunki, Lehto and Kiviperä. The city lies on a roughly 250-meter-high plateau, from which the waters flow in five directions. 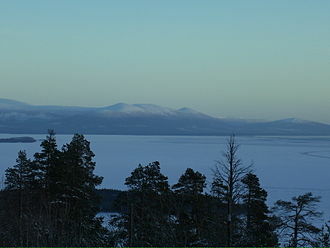 In the area of Kuusamo there are many hills (Finn. vaara) and fells (Finn. tunturi). The highest elevations are Valtavaara (492 m), Kuntivaara (481 m), Iivaara (469 m) and Rukatunturi (462 m), the site of the Ruka ski center. Ninety percent of the land area is forested. The forests consist mainly of pine trees (70%) with some spruce (20%) and deciduous trees (10%). 801 km2 (309 sq mi) or 14% of the area of Kuusamo is covered by water. The largest of the 166 lakes in the area are Joukamojärvi, Kiitämä, Kitka, Kurkijärvi, Kuusamojärvi, Muojärvi and Suininki. Rivers in the area include Oulankajoki, Kitkajoki, Kuusinkijoki and Pistojoki flowing eastward to the White Sea and Iijoki westward to the Gulf of Bothnia. The 270 km2 (100 sq mi) area of Oulanka National Park is shared between northern Kuusamo and neighboring Salla municipality. The landscape is dominated by pine forests, Oulankajoki river and its side branches with their sandbanks and rapids, and in the northern part vast marsh areas. In the wilderness live 30 species of mammals and 120 species of birds, including brown, stone and white-tailed eagle. Wolves and lynxes are rare. Rapids in Oulankajoki include Kiutaköngäs, Taivalköngäs, Jyrävä, Niskakoski and Myllykoski. Near the southern border with Suomussalmi is the canyon lake Julma Ölkky with up to 50 m (160 ft) high cliffs. The average annual temperature is −0.37 °C, annual precipitation 525 millimetres (20.7 in). The warmest month is July with an average temperature of +14.3 °C, coldest January with −13.2 °C. The coldest ever measured temperature was −48 °C in Kiutaköngäs. Kuusamo is one of the snowiest areas in Finland: the ground is snow-covered for about 200 days a year, from late October until mid-May, with a thickness of 80–90 centimetres (31–35 in). The center of Kuusamo is located approximately 60 km (37 mi) south of the Arctic Circle, thus polar day and night play a major role. From 14 to 29 June Kuusamo has midnight sun. On 31 August 2018 Kuusamo had 15,219 inhabitants. Nearly two-thirds of the population lives in the city center, called the village of Kuusamo, the rest is divided among the villages in the rural hinterland. Like most communities in the Northern and Eastern Finland, there has been marked migration to larger urban areas. The population peaked in the late 1960s at nearly 21,000 residents. With the exception of a period in the 1990s, the population has steadily declined since then. The migration has had an effect on Kuusamo's age structure, as it is mainly young people who leave the town. For example, between 1998 and 2001, the percentage of people aged less than 15 years fell from 25% to 23%, while the share of those aged over 64 years rose from 12 to 14%. The main economic activities in Kuusamo include forestry, reindeer husbandry, small industries and tourism. The unemployment rate, at 16.2% (2003) is relatively high. In 2002 there were 248 farms in Kuusamo. Given the climatic conditions, milk and meat production have a major role, including reindeer meat from the approximately 10,000 semi-domesticated reindeer which roam the pastures in Kuusamo. The forestry and wood processing industry also employs over 1,000 people. Around one million tourists visit Kuusamo annually. In 2002, 291,222 overnight stays were registered, 17% of which were by foreign guests. There are around 6,000 cottages (mökki) in Kuusamo, more than any other municipality in Finland. The Ruka ski center, centered on the 492-metre Rukatunturi, is one of the largest in Finland with a total of 16,000 beds, four hotels and 28 restaurants. Activities include skiing, snowmobile tours and excursions with reindeer and dog sleds. Ruka benefits from a long snowy season, from mid-October to mid-June. In summer, Kuusamo is a popular wilderness destination for fishing, kayaking and hiking. The most famous hiking trail (as well as Finland's most popular) is Bear's Ring (Karhunkierros), which runs for 80 km (50 mi), mostly in the Oulanka National Park. National highway 5 (E63) connects Kuusamo to Southern Finland. Highway 20 leads from Kuusamo to Oulu, and the main road 81 to Rovaniemi. In Suoperä at Kuusamo, there is a border crossing to Russia, opened for international traffic in 2006. In 2007, 17,000 border crossings recorded. Kuusamo Airport is 6 km (4 mi) from the city center and 27 km (17 mi) from Ruka. It was opened in 1969 and has since been expanded several times. The airline Finnair offers daily direct flights from Helsinki, adding charter flights during the tourist season. Seasonal flights are offered by Finncomm Airlines and Blue1 from Helsinki and Rossiya Airlines from St. Petersburg. In 2007, 108,394 passengers used the airport. While Kuusamo mainly attracts visitors because of its natural beauty, the city has produced little of interest in the traditional sense. Because the city center was completely destroyed in the Lapland War and then had to be rebuilt quickly and economically, Kuusamo is seen as largely uninteresting from an architectural point of view. 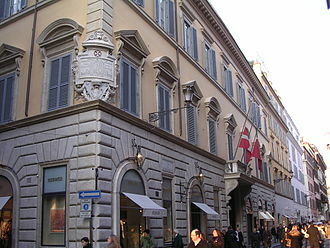 In contrast - at least considering the small population - the cultural life of the city is relatively lively. The Kuusamo Hall in the town center, completed in 1996, acts as a convention and cultural center. 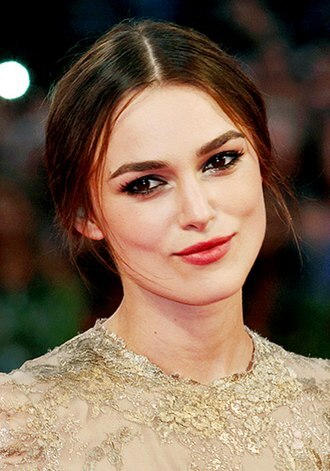 In it one can find regular musical and theatrical performances as well as changing art exhibitions. The Kuusamo Local History Museum is an outdoor museum that has been established on a historic farm. Additionally, a school museum is set up in the old school of Kirkkoketo. The church in the center of Kuusamo was built in 1951. It stands on the site of the old wooden church from 1802, which was burnt down in 1944 Lapland War by German troops. At that time German soldiers buried the two church bells (one endowed to the church by Charles XI of Sweden in 1698, and the other originating from the year 1721) in the cemetery to secure them from the advancing Soviet troops. The bells were considered lost until 1959, when the former German regimental commander visited Kuusamo and revealed the location of the buried bells. Today these same bells are housed in the rebuilt church. Kuusamo is the venue of several international winter sports competitions. In Ruka skiing there is a stadium with the Rukatunturi-hill (HS142) and a smaller-K64 ski jumping hill and lighted trails and a biathlon facility. Since 2002, the World Cup kick-off in ski jumping and Nordic combined and cross country skiing World Cup races in Ruka Nordic Opening in late November at a joint event in Kuusamo instead. 2006's 16,000 spectators, the competition. Ruka in 2005, the Freestyle Skiing World Cup instead. ^ a b c "Area of Finnish Municipalities 1.1.2018" (PDF). National Land Survey of Finland. Retrieved 30 January 2018. ^ a b c "Ennakkoväkiluku kuukausittain sukupuolen mukaan alueittain, elokuu 2018" (in Finnish). Statistics Finland. 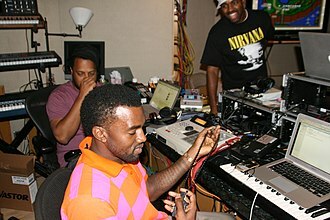 Retrieved 21 October 2018. ^ "Méteo climat stats for Kuusamo 1981-2010". Météo Climat. Retrieved 20 March 2017. ^ "Météo climat stats record levels for Kuusamo". Météo Climat. Retrieved 20 March 2017. Wikivoyage has a travel guide for Kuusamo. Rovaniemi is a city and municipality of Finland. It is the capital and commercial centre of Finlands northernmost province. It is situated about 10 kilometres south of the Arctic Circle and is between the hills of Ounasvaara and Korkalovaara, at the confluence of the river Kemijoki and its tributary, the city and the surrounding Rovaniemen maalaiskunta were consolidated into a single entity on 1 January 2006. The new municipality has an area of 7,581.86 square kilometres, the rova part in the name Rovaniemi has often been considered to be of Saamic origin, as roavve in Saami denotes a forested ridge or hill or the site of an old forest fire. In Southern Saami dialects, rova meaning a heap of stones, the niemi part of the name means cape. Different spellings include Inari Sami, Ruávinjargâ, Northern Sami, Roavenjárga and Roavvenjárga, Skolt Sami, periodic clearance of new land for agriculture and the practise of slash-and-burn cultivation began around 750–530 B. C. The Sami are considered to be Laplands most indigenous existing population, the exploitation of Laplands natural resources in the 1800s boosted Rovaniemis growth. Extensive logging sites and gold fever attracted thousands of people to Lapland, as the mining of natural resources was increased, Rovaniemi became the business centre of the province of Lapland. During the Second World War, Finland signed the Moscow Armistice, while the German rear guard was going about the destruction, an ammunition train in Rovaniemi station exploded and set fire to the wooden houses of the town. The German troops suffered casualties, mainly from glass splinters. A Finnish commando unit claimed to have blown up the ammunition train, the cause was unknown and generally assumed to be the deliberate intent of Rendulic. During these hostilities 90% of all the buildings in Rovaniemi were destroyed, there is a German cemetery 19 km from Rovaniemi where soldiers killed fighting in Lapland during the war are entombed. Because of the nature and numerous recreational opportunities, tourism is an important industry in Rovaniemi. The city has a number of hotels and restaurants located both in the centre and on the outskirts of the town, hosting over 481,000 visitors in 2013, since Rovaniemi represents the capital of the Province of Lapland, many government institutions have their offices there. The Moscow Peace Treaty was signed by Finland and the Soviet Union on 12 March 1940, and the ratifications were exchanged on 21 March. It marked the end of the 105-day Winter War, Finland had to cede border areas to the Soviet Union. The treaty was signed by Vyacheslav Molotov, Andrey Zhdanov and Aleksandr Vasilevsky for Soviet Union, the Finnish government received the first tentative peace conditions from the Soviet Union on 31 January. By this point, the regime was prepared to temper its claims, the demands were that Finland cede the Karelian Isthmus, including the city of Viipuri, and Finlands shore of Lake Ladoga. The Hanko Peninsula was to be leased to the Soviet Union for 30 years, Finland rejected these demands and intensified its pleas to Sweden and the United Kingdom for military support by regular troops. Although Finland in the run had no chance against a country fifty times its size. 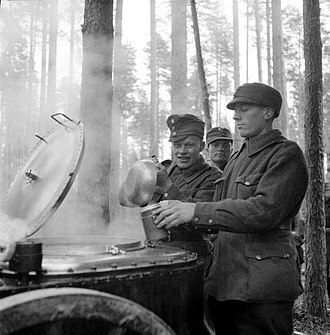 On 6 March, a Finnish delegation led by Prime Minister Risto Ryti travelled to Moscow, during the negotiations, the Red Army broke through the Finnish defence lines around Tali and were close to surrounding Viipuri. 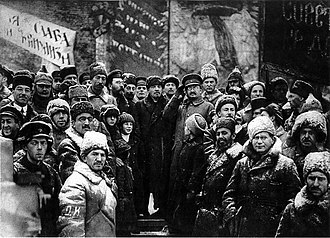 The Peace Agreement was signed on the evening of 12 March, Moscow time, i. e.1 hour on March 13, the protocol appended to the treaty stipulated that the fighting should be ended at noon, Leningrad time, and the fighting continued until that time. 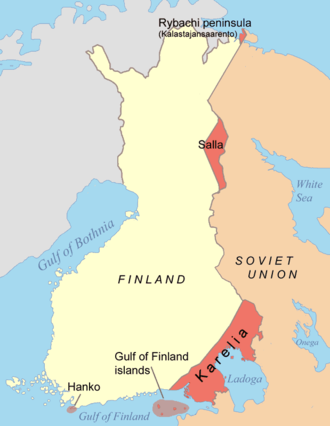 Finnish concessions and territorial losses exceeded those demanded by the Soviets pre-war, Finland was forced to cede nearly all of Finnish Karelia, even though large parts were still held by Finlands army. Military troops and remaining civilians were evacuated to inside the new border. 422,000 Karelians, 12% of Finlands population, lost their homes, there was an area that the Russians captured during the war, which remained in Finnish hands according to the Peace Treaty, Petsamo. However, the treaty stipulated that Finland would grant free passage for Soviet civilians through Petsamo to Norway. 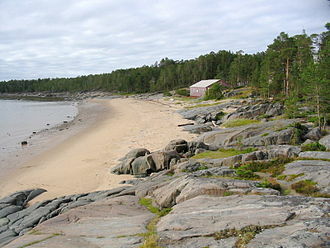 Finally, the Hanko Peninsula was leased to the Soviet Union as a base for 30 years at an annual rent of 8 million marks. Additional demands were that any equipment and installation on the territories were to be handed over. Kainuu is one of the 19 regions of Finland. There are 18 regions in mainland Finland, and the autonomous Åland Islands, Kainuu borders the regions of Northern Ostrobothnia, North Karelia and Northern Savonia. In the east it borders Russia, boreal forest makes up most of the biome in Kainuu. The forest in Kainuu mostly consists of birches and spruces, the atypical regional geography and landscape consist of lakes and vast uninhabited forest areas. The largest lake in the region is the Oulujärvi, one of the largest lakes in Finland and its shorelines, open waters and islands in Kainuu belong to the municipalities of Vaala and Kajaani. The highest point in Kainuu is the Iso Tuomivaara, located in the municipality of Hyrynsalmi, culturally Kainuu is part of larger Eastern-Finnish cultural heritage. The dialect of Kainuu is based on Savonian and Karelian dialects, the region of Kainuu is made up of eight municipalities, of which three have city status. The administrative capital of Kainuu is Kajaani, formerly one of the nine municipal members of the Kainuu region became part of the Northern Ostrobothnia in the beginning of the year 2016. The municipality of Vaala is still counted as part of the region in the end of 2015, in 2012 Kainuu region had a total of 29722 jobs. The largest sector in the employment market of Kainuu is the sector with 73,7 % share of the regions entire employed workforce. The industrial and construction sector follow as the 2nd largest actor with 17,6 % of the employed working under these fields, third largest sector is the forest industry and agriculture with a 7,5 % workforce. The smallest uncounted factor in these statistics are the jobs that don’t fit easily under any of three general terms mentioned above. The miscellaneous jobs form 3361,2 % of the region’s workforce, the total unemployment of Kainuu was in 20146001 which is 16,9 % of the workforce of the area. The nationwide average at the time was 12,4 %, the worst unemployment was in the town of Kuhmo with 19,6 % people unemployed. The town with the least amount of unemployment was the municipality of Sotkamo with 14,1 % people unemployed, Kainuu has a total of 4301 firms by each sector in its economy. A charter is the grant of authority or rights, stating that the granter formally recognizes the prerogative of the recipient to exercise the rights specified. The word entered the English language from the Old French charte and it has come to be synonymous with the document that lays out the granting of rights or privileges. The term is used for a case to an institutional charter. A charter school, for example, is one that has different rules, charter is sometimes used as a synonym for tool or lease, as in the charter of a bus or boat or plane by an organization, intended for a similar group destination. A charter member of an organization is a member, that is. Anglo-Saxon Charters are documents from the medieval period in Britain which typically make a grant of land or record a privilege. They are usually written on parchment, in Latin but often with sections in the vernacular, describing the bounds of estates, the British Empire used three main types of colonies as it sought to expand its territory to distant parts of the earth. These three types were royal colonies, proprietary colonies, and corporate colonies, a charter colony by definition is a colony…chartered to an individual, trading company, etc. by the British crown. Although charter colonies were not the most prevalent of the three types of colonies in the British Empire, they were by no means insignificant, a congressional charter is a law passed by the United States Congress that states the mission and activities of a group. Congress issued federal charters from 1791 until 1992 under Title 36 of the United States Code, a municipal corporation is the legal term for a local governing body, including cities, towns, charter townships and boroughs. Municipal incorporation occurs when such municipalities become self-governing entities under the laws of the state or province in which they are located, this event is marked by the award or declaration of a municipal charter. 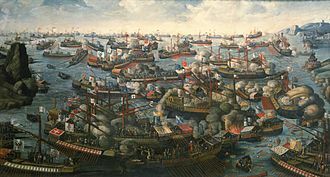 Charters for chivalric orders and other orders, such as the Sovereign Military Order of Malta, in project management, a project charter or project definition is a statement of the scope and participants in a project. Ski jumping is an Olympic winter sport which was firstly contested in Norway in the late 19th century, and spread through Europe and North America in the early 20th century. The ski jumping venue consists of the ramp, take-off table. Each jump is evaluated according to the distance traveled and the style performed, the distance score is related to the construction point, which is a line drawn in the landing area and serves as a target for the competitors to reach. The score of each judge evaluating the style can reach a maximum of 20 points, the jumping techniques has evolved over the years, from jumps with the parallel skis with both arms pointing forwards, to the V-style, which is widely used today. Ski jumping has been included at the Winter Olympics since 1924, womens participation in the sport began in the 1990s, while the first womens event at the Olympics has been held in 2014. 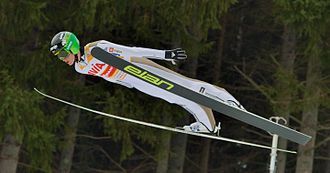 All major ski jumping competitions are organised by the International Ski Federation, stefan Kraft holds the official record for the longest ski jump with 253.5 metres, set in Vikersund in 2017. Ski jumping can be performed in the summer on an in-run where the tracks are made from porcelain, the highest level summer competition is the FIS Ski Jumping Grand Prix, contested since 1994. Like most of the Nordic skiing disciplines, the first ski jumping competitions were held in Norway in the 19th century, the recorded origins of the first ski jump traces back to 1808, when Olaf Rye reached 9,5 metres. Sondre Norheim, who is regarded as the father of the ski jumping, won the first-ever ski jumping competition with prizes. The first larger ski jumping competition was held on Husebyrennet hill in Oslo, the event was moved to Holmenkollen in 1892 due to the poor infrastructure and the weather conditions, and is today still one of the main ski jumping events in the season. In the late 19th century, Sondre Norheim and Nordic skiier Karl Hovelsen emigrated to the United States, in 1924, ski jumping was featured at the 1924 Winter Olympics in Chamonix, France. The sport has been featured at the every Olympics since then, in 1935, the origins of the ski flying began in Planica, where Josef Bradl became the first competitor in the history to jump over 100 metres. Posio is a municipality of Finland. It is located in the province of Lapland, the municipality has a population of 3,470 and covers an area of 3,039.12 square kilometres of which 506.14 km2 is water. The population density is 1.14 inhabitants per square kilometre, neighbour municipalities are Rovaniemi, Kemijärvi, Salla, Kuusamo and Pudasjärvi. The municipality has a language, Finnish. Major employers in Posio are municipality itself, major pottery manufacturer Pentik, the European route E63 runs through the northern-eastern parts of the municipality. Korouoma canyon and natural reserve is located in Posio, posios most renowned attractions are the Pentik-mäki Culture Centre, Riisitunturi National Park, Korouoma Nature Reserve, and the clear waters of lakes Kitkajärvi and Livojärvi. There are many outdoor recreational things to do in Posio, the worlds northernmost ceramics factory is located in Posio. Pentik Oy interior design company was established in 1971 by Anu, regular events in Posio are the Posio Fair, Amateur Theater event Teatterihelinät, and Traditional Fish Fair Market in July. View of Rovaniemi from Jätkänkynttilä (Lumberjack's Candle Bridge) in September 2011. Satellite image of Fennoscandia in winter. The northern part of the Gulf of Bothnia, the Bothnian Bay, is covered with sea ice. June 2006 view of the Gulf of Bothnia in Finland. The childhood home of author Kalle Päätalo has become one of the most visited tourist attractions in Taivalkoski.